Euro Grand Casino is powered by Playtech casino software, one of the biggest software providers in the world and is owned and operated by Crown Solution Gaming Ltd. The site and software is available in English, German, French, Spanish, Dutch, Russian, Norwegian, Swedish, Italian, Turkish, Danish, Finnish, and accepts three different currencies Pounds, Euros and US dollars. The casino is certified by the Kahnawake Gaming Commission that is based at Canada. Players can choose from a selection of 80 games. 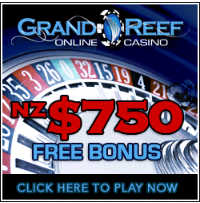 It offers a good range of games that include table games like- Roulette, and craps. The Casinos 25 line slot games are available with excellent graphics. It also has a great variety of video poker games such as Joker Poker, Jacks or Better and Aces and Faces. The software is available in a no download version and can be played in most browsers from any computer any time. New players are eligible for a welcome bonus of $1000 on their first deposit and a $500 bonus on their second deposit. Players who registered a real e mail address are also eligible for a $500 bonus. Most of the games are enhanced by huge progressive jackpots, with one lucky winner taking home half a million dollars recently. The site uses different payment gateways for the player to make payments or withdraw their money. They use Bank Draft, Citadel, Click2Pay, ECOCard, ePassporte, eWalletXpress, FirePay, Maestro, Master Card, MoneyBookers, Neteller, Paysafe Card, Solo, Switch, UKash, UseMyBank, Visa, Wire Transfer for accepting and making payments. The casino offers a highly professional customer service team that is available 24/7 through email, chat and telephone.